Some may call you a control freak. Others call you crazy. You may be a little of both, but you basically want things done your way (the fun way). We understand, and therefore dedicate this Jen & Kim Melrose pump to you. The design is pretty simple- a round toe, 4.5 inch heel and half inch platform. Yet, they're bright, fun and a little funky. Here's the kicker- (wait for it) they're customizable! You can go to the website, pick a design and then choose your material and color. They even let you do the heel and platform in a different color if you'd like. This teal lizard pump just happens to be one of our favorites. Making (er customizing) your own shoes is hard work. 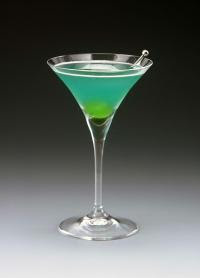 Relieve tension this evening with a Samurai (cool color and name! Recipe and image courtesy of CocktailAtlas.com). Tell the bartender to combine Marie Brizard Charleston Follies (or passion fruit liqueur), Ginjo Shirataka (sake), Blue Curacao, a little lime juice and a dash of mint liqueur. The result will be a sweet concoction that seems harmless but will easily sneak up on you. That means a little restraint will go a long way in avoiding the morning Judo Chop of a headache that comes from over indulging. Customizable shoe just made my entire life.